My name is Nicola McClean and I hope you will bear with my website while it is currently under construction and I learn as I go along how to make it as much fun for you to navigate as it is for me to show you my range of cushions. 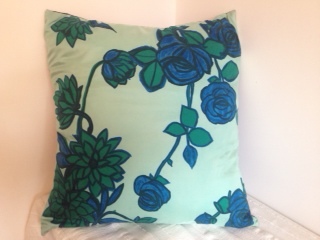 I love creating my handmade vintage scarf cushions and enjoy scouring vintage fairs, charity shops and carboot sales to source new materials even more. Everything I use is recycled down to the buttons and ties making each product individual and adding value to previously used objects. I work from my kitchen table in Teddington, south-west London and make everything myself so there is only ever a certain number of cushions available at any one time but I will try and post photos of every new one as soon as it is completed. The instigation for the cushions was my love of scarves and sorrow that one can (usually) wear only one at a time, leaving the rest languishing in a drawer. Even then, when wearing a favourite scarf I felt it was a pity that the gorgeous design could not be properly seen so the idea of a scarf cushion was born! So, if you don’t see anything you fall in love with or nothing matches your decor, please search your own scarf drawer – or that of your mother’s or grandmother’s – and let me create a cushion for you from a family possession that hardly sees the light of day. You may have a family heirloom in the making! Contact me (details in the bottom righthand corner of the page) to arrange a visit if you would like to see my stock or if you have any questions about my work. I supply artisan-style shops, take stands at vintage fairs, participate in Richmond Arthouse Open Studios and sell privately.